If you are curious about Judith Hanson Lasater’s new book on restorative yoga, then this video is for you. 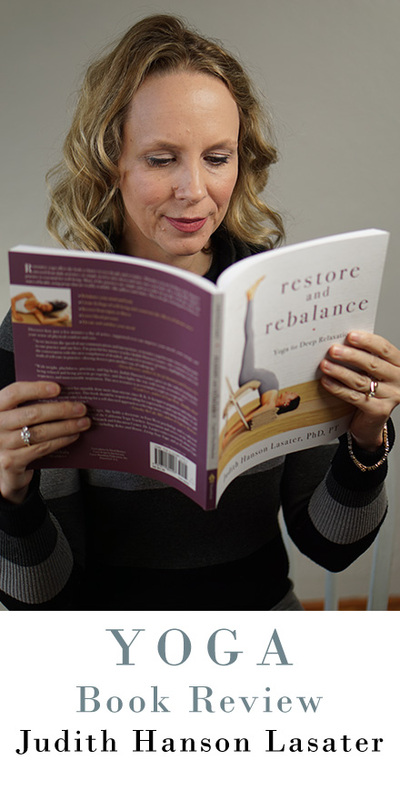 On December 26, 2017 Shambhala will release Judith Hanson Lasater´s brand new restorative yoga book, Restore and Rebalance, Yoga for Deep Relaxation. This book comes 22 years after her original publication, Relax and Renew. For those yoga teachers and yogis who are wondering if this new book is simply an update of her first restorative yoga book or a rewrite then we can take a collective 3-part yogi-sigh of relief, because this is actually a new book and not just an update. YAY! The poses in Restore and Rebalance are different from Relax and Renew, but as Judith Hanson Lasater says the concepts and techniques of restorative yoga are based on the same principles. 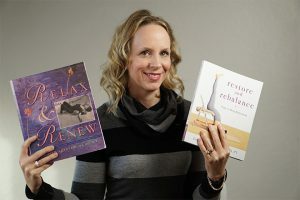 The book promises to help those of us who are suffering exhausted from stress in our time-pressured, constantly connected world. The book is accessible for all ages and levels of health, especially those who are recovering from injuries and illnesses and those who want to stabilize their mood. The book offers poses and sequences for the reader/yogi and yoga teacher. So, the book does an excellent job of laying out 20 restorative yoga poses for yoga students and teachers alike, including five variations on savasana. I was particularly interested in Judith Hanson Lasater´s organization. She began with 4 head above heart poses to transition the restorative yoga student and as a way to disconnect from their outer world and reconnect with their inner one. Each pose includes the benefits, some special instructions, especially contraindications for the pose, the props you will need, how to set up the pose, how to be in the pose, how to come out of the pose and some notes for teachers. The bulk of the restorative yoga poses are 11 poses that are head below heart poses that include backbends, inversions, forward bends, and even some standing poses. There are 5 variations of savasana. Part three includes various sequences from a 20 and 60 minute practice to therapeutic practices for anxiety, children, depression, fatigue and stress, lower back pain, menopause, pregnancy, and postpartum. This book is a clear, concise road map to setting up, coming into, coming out of and teaching these restorative yoga poses. The photos are clear and also contribute to the roadmap of how to come into the poses. Judith Hanson Lasater steps back to let you have your own experience in the pose. I think the book does a good job of offering the body a chance to rest deeply and revitalize. I especially love the attention that Judith Hanson Lasater gives at the beginning of the book to head and neck support and the use of a blanket to support the head and neck for your nervous system relaxation. She spends 3 pages on this and I think this is my biggest takeaway as a teacher, practitioner and my favourite part of the book. I often have two complaints about restorative yoga books and the way restorative yoga is offered to the world. One is that what is displayed in the book is not generally realistic for the average person at home or even the fledgling yoga studio or yoga teacher. The use of props is luxurious, but it is not unusual to see 3 bolsters and 8 blankets in one pose. The first pose in the book for example lists 5 separate props in addition to 8 blankets. I just do not think this is realistic in terms of resources for the average individual, yoga teacher or yoga studio. The second is that restorative yoga is often promoted as being of benefit to those who are sick, elderly or injured. While restorative yoga is of enormous benefit to those populations, restorative yoga is essential to our entire population, including the yoga world these days when competition for the best inversion and yoga shape is rampant. We live in a culture of competition and achievement where we are driven to effort our way through absolutely everything, including yoga. It is good to see Judith Hanson Lasater emphasize the need to disconnect and reconnect with our inner world. I just get frustrated with market-speak that focuses on doing, whether that be recovering from illness or injury, rather than undoing the effects of our performance-based culture. Judith Hanson Lasater brings an incredible skill set to writing this book, she has a bachelor of science degree in physical therapy and the evidence of her understanding of anatomy comes through throughout the book. Additionally her longevity and experience in the field of yoga is unparalleled in the age of insta-success and overnight mega-followers. Judith Hanson Lasater cofounded Yoga Journal in 1975. She wrote the asana column in the magazine for 13 years, as well as articles relating to postures, anatomy, kinesiology, yoga therapeutics, and breathing. She has taught internationally at Yoga conferences and trained yoga students and teachers all over the world. I would recommend this book as a how-to book to have beside you on your yoga mat as you practice restorative yoga if you are a yoga teacher planning restorative yoga classes or an experienced restorative yoga student. I think this book would be most useful for yoga teachers and students who want ideas for planning their restorative yoga classes and experience. I also think this book is useful for students who prefer to practice restorative yoga without a teacher or video with an instructor talking or any music in the background. You could follow the sequences in the back or make your own. This book is not for you if you do not have many yoga props or if you are not good at adapting poses shown in a book. If you can look at a shape and recreate that shape without as many props then you will be fine. Otherwise, this is for the more advanced student who already has a lot of props and is able to look at a pose, adapt the pose and think about their own sequencing. Thanks so much for watching, if this review of Judith Hanson Lasater´s Restore and Rebalance was helpful for you then please give it a thumbs up. Let me know in the comments what is your favourite yoga book. Be sure to subscribe and turn on notifications, I have a lot of great content coming up.